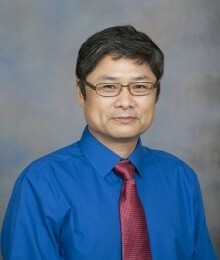 Peihua Qiu received his Ph.D. in statistics from the Statistics Department at University of Wisconsin at Madison in 1996. He worked as a senior research consulting statistician of the Biostatistics Center at Ohio State University during 1996-1998. He then worked as an assistant professor (1998-2002), an associate professor (2002-2007), and a full professor (2007-2013) at the School of Statistics at University of Minnesota. He is an elected fellow of the American Statistical Association, an elected fellow of the Institute of Mathematical Statistics, an elected member of the International Statistical Institute, a senior member of the American Society for Quality, and a lifetime member of the International Chinese Statistical Association. He served as associate editor for Journal of the American Statistical Association (2006-2012), Biometrics (2011-2012), Technometrics (2007-2012), and Statistical Papers (2011-2012), and guest co-editor for Multimedia Tools and Applications, and Quality and Reliability Engineering International. He was the editor-elect (2013) and editor (2014-2016) of Technometrics, and is currently the founding chair of the Department of Biostatistics at University of Florida, started since July 1, 2013. Peihua Qiu has made substantial contributions in the areas of jump regression analysis, image processing, statistical process control, survival analysis and disease screening and surveillance. So far, he has published over 100 research papers, many of which appeared in top journals, including Technometrics, Journal of the American Statistical Association, Annals of Statistics, Annals of Applied Statistics, Journal of the Royal Statistical Society (Series B), Biometrika, Biometrics, IEEE Transactions on Pattern Analysis and Machine Intelligence, and IIE Transactions. His research monograph titled, Image Processing and Jump Regression Analysis, (2005, Wiley) won the inaugural Ziegel prize in 2007 for its contribution in bridging the gap between jump regression analysis in statistics and image processing in computer science. His second book titled, Introduction to Statistical Process Control, was published in 2014 by Chapman & Hall/CRC.